Theresa May's Conservatives would face a crushing defeat if the UK holds European elections in May, according to a new poll. May’s party would take only 23% of the vote compared to 38% for the Labour party, according to the poll for the Open Europe think-tank by Hanbury Strategy. 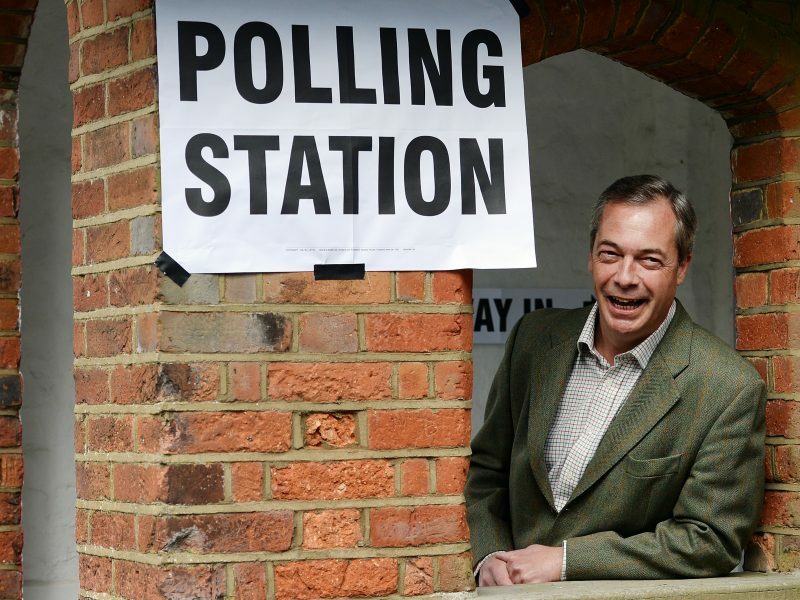 Nigel Farage’s newly created Brexit party would take 10%, while his former party UKIP would claim 8%. In the 2014 European elections, UKIP topped the poll but has seen most of its MEPs leave the party under the leadership of Gerard Batten, who has moved the party further towards the extreme-right and overt Islamophobia. Among the pro-European parties, the Liberal Democrats would take 8% according to the poll, with the Change UK party launched by pro-Remain MPs who defected from Labour and the Conservatives, and the Green party, both on 4%. The survey also suggests that Remain supporters would be more likely to vote – 47% compared to 38% of Leave voters. 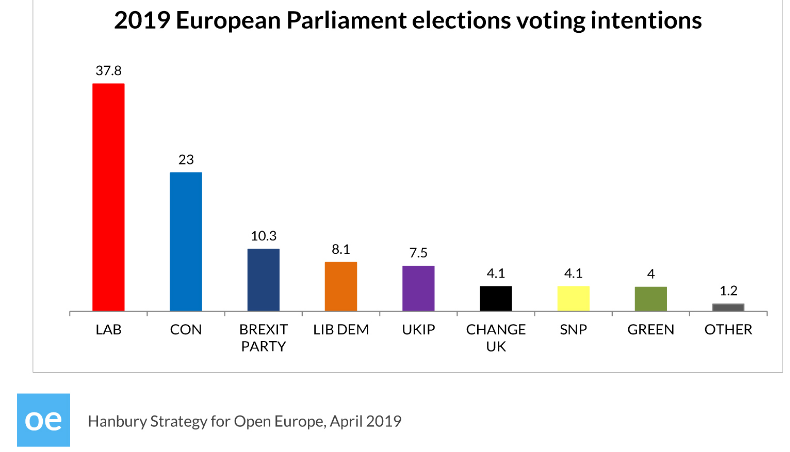 However, pre-campaign surveys ahead of European elections in the UK have tended to under-represent support for Eurosceptic parties. That volatility would be particularly acute amid the turmoil over Brexit, and Farage’s party would expect to poll far higher. Although the prime minister has repeatedly said that she does not want the UK to elect MEPs, almost three years after 52% of Britons voted to leave the EU in a referendum, it is becoming increasingly likely that the UK will still be in the EU on 23 May when the European polls take place. “The idea of the British people going to the polls to elect MEPs three years after voting to leave the EU hardly bears thinking about. There could be no more potent symbol of parliament’s collective political failure,” May warned last week. The election results could also be a crucial factor in whether the UK holds a second referendum on whether to stay in the EU. 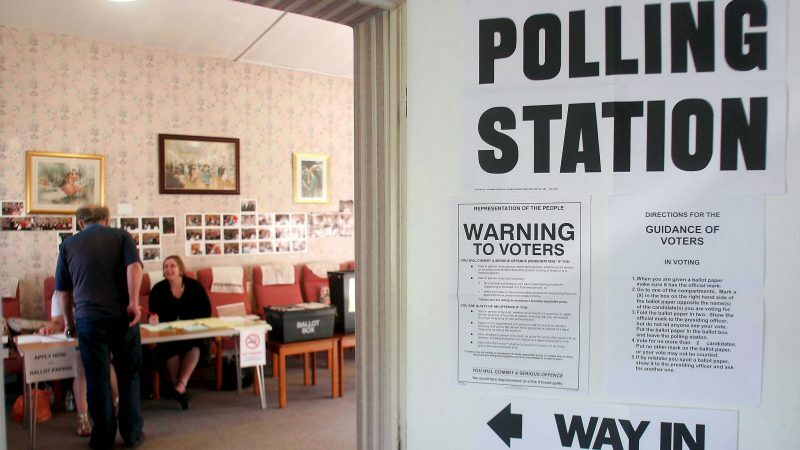 The legal change required to hold the European elections was made by May’s government earlier this week, and local authorities and the Electoral Commission have been instructed to organise ballots and polling stations. The Labour party will announce its list of MEP candidates on 17 April, according to a selection timetable released on Wednesday. Earlier this week, Conservative party headquarters wrote to all party members, setting out its selection plans for the poll. The closing date for nominations for the Conservatives is 24 April. Other parties are also preparing their own lists of candidates. We can hope. It would help reduce the brexity madness, otherwise known as brexivine spongiform encephalopathy. The British people voted to leave the EU by a 1.4 million majority in 2016. The 2017 conservative Manifesto on which Mrs May and her government were elected is quite clear. It pledged to leave the EU. It pledged to leave the Single Market and Customs Union, end the supremacy of the ECJ in these islands and to take control of our borders. Since Mrs May has not done these things, in a democracy consequences follow at the ballot box.